Published twice a year, the Netherlands Architecture Institute's Architecture Bulletin presents essays in word and image about the designed environment of today, yesterday and tomorrow: subjective arguments complemented by personal reflections on architecture, about what is and is not happening, and the discourse concerning this. In short, these essays are about architecture's potential significance. 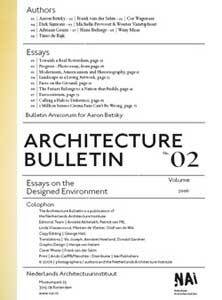 The second issue of the Architecture Bulletin is dedicated to former NAI director Aaron Betsky, who has left Rotterdam for the Cincinnati Art Museum in the USA. 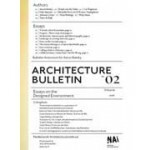 The authors of this 'Bulletin Amicorum' are people with whom Betsky has worked in recent years, and they address themes that Betsky holds dear and has placed in the foreground in the NAI's programming over the last five years. The subjects of the essays include the future of the polder landscape of the Netherlands and strategies for urban renewal, and there is also a response to the question of what makes Dutch design so good. The history of architecture is addressed in texts about the field's Eurocentricity and on the subject of the disregarded influence of American modernism on Dutch architecture.